(Ver 1.1) This is now part seven of a series of advanced Bible study lessons on the methods that God has used to conceal truth and information in the Bible for us to find. By studying these methods we will greatly increase our ability to understand the truth of God’s Word. I have covered a lot important concepts and information in these lessons that will not be repated. If you have not read this series from the beginning I would strongly suggest that you go back and start with “Part 1“. archetypal – representing or constituting an original type after which other similar things are patterned. Archetypal Patterns. This term describes something that is a pattern of something else that is to come. In other words there is a recognizable resemblance of the past thing from knowing or seeing the future thing. I hope you got that last statement, because it was significant. 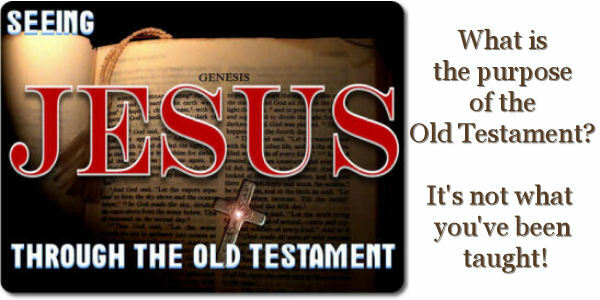 The idea that you must know the new in order to recognize the pattern in the old is the primary reasons why the Jewish people don’t see Christ the Messiah all over the Old Testament and we do. Because they don’t know the new, they don’t see the old patterns that reflect and describe the new. God provides a short list of some things that can be found in the Old Testament and declares that these things are types and shadows of things that were to come in Jesus Christ. The principle is again that God gave us things in the law that were recorded to provide insight into something that was going to come in the spiritual realm. The thing that was to come was greater than the thing given to be a type. It’s like if I’m walking in the sunshine and I cast a shadow on the ground. You might be able to look at just the shadow and tell a lot about me, but there are a lot of the details omitted in the shadow representation. Only by looking correctly at the real can you fully comprehend the shadow. There lies a problem with people reading just the Old Testament in isolation, they are looking at shadows and it is many times very difficult to determine what something is by just looking only at the shadow. The term shadow is a term that implies the light has been blocked by something. In other words a natural shadow on the ground is caused because some object is blocking the light. The absence of light causes shadows. In the natural realm the light can be from the sun or from another light source like a lamp. In the spiritual realm God is the Light! Who is blocking God from shining into the minds of people on the earth like the Jewish people who do not know Jesus? The Bible says that “the god of this world has blinded the minds of them that believe not”. This verse is of course speaking of Satan as being in control of our current world system. But the term “blindness” means the inability to see light. This applies physically and spiritually equally. There are types and shadows from Genesis chapter 1 until Malachi. If you are a serious student of the Word of God you will also realize that the Gospels are all predominantly Old Testament. I think sometimes people forget this, but Jesus did not implement the new covenant until his resurrection. Knowing this fact we can see further types and shadows in the life and ministry of Jesus. For example, in the life of Jesus, he walked up to a fig tree and cursed it and it died overnight. Maybe you didn’t realize it, but Jesus didn’t get angry and do anything on a whim or by accident. This action of cursing the fig tree was symbolic and a type of something else that was a much greater truth. Since this is not my subject I will not attempt to explain it for the sake of time. I guess I should try to point out that a pattern found in the Old Testament might be very similar to an analogy that I previously discussed in the topic of symbolism. Sometimes types can be real people that point us to spiritual truth. But a type or pattern can also be a holiday, like the Feast of Passover. The Passover Feast can be viewed as a type of Jesus the lamb of God being sacrificed and Him shedding his blood. Then there is story of Moses in the wilderness who puts a serpent on a pole and everyone that looks upon it is made whole. Again this is a type and a shadow of Christ’s work on the cross. Christ became sin that we might become the righteousness of God. There are many patterns given within the law of Moses and I cannot begin to try to include them all in this blog. This verse in Hebrews actually describes types and shadows very accurately. The law of the Old Testament contains many shadows of the good things to come. Of course it then tells us that these things are not the clear image of the real item. After all they are just shadows. God informs us the real thing that was coming is the New Covenant. The things given in the Old were purely given to point you to the real. That is why the nation of Israel is in so much deception. They have embrace the shadows and have chosen to purposely ignore the real. There are so many other examples that I could give you right here, that I’ll just pick one example, that is found in the book of Ruth. Ruth was a Moabite or gentile woman, whose Jewish husband died. We can see a man called Boaz who is called the kinsman redeemer of Ruth. Ruth moves back to Bethlehem with her mother-in-law, where she meets Boaz and eventually marries him. Without going into a lot of details of this story the major types and shadows are as follows, Ruth represents the church, Boaz represents Jesus Christ and Naomi represents the Nation of Israel. A type and a shadow is never a perfect image of the true image portrayed. Like a real shadow on the ground it always points you to the real image that is causing or making the shadow. The shadow should be an outlined representation of the real without all of the detailed features of the true image. This of course is sometimes difficult to see or recognize at first until you figure out what the shadow is pointing you to. But once you see it then it becomes much clearer what everything means. There are many other types and shadows in the book of Ruth and I didn’t give you all of them because it would certainly complicate your world without a much more in-depth teaching and understanding. So I’ll end this blog on that note. We have now gone through seven different techniques that God has utilized to hide information in the Bible for us to find. That of course is not every method that there is and hopefully I can continue to discuss some more in my next blog. God Bless! If you would like to continue reading this series of lessons you can go to “Part 8“. Posted on March 10, 2010, in Bible Interpretation, Keys to Understanding and tagged Bible, Christianity, Church, God, Interpretation, Jesus, Prophecy, Religion, Revelation, Truth, understanding. Bookmark the permalink. Leave a comment.